You can use any firm white fish in this easy-to-make recipe. 1. Mix the brown sugar, vinegar, soy and ginger in a bowl. Add the fish, coating thoroughly; chill for at least 30 minutes. 2. Preheat the oven to 180˚C, gas mark 4. To make the fritters, mix the flour, baking powder, sweetcorn and all but a small handful of both the salad onions and coriander. Stir in 150-200ml cold water until you have a spoonable batter; season. and roast until cooked through, about 12-15 minutes. 4. Meanwhile, heat the oil over a medium-high heat. Add heaped spoonfuls of the batter, flatten and fry for 3-4 minutes on each side until golden (you may need to cook in batches). 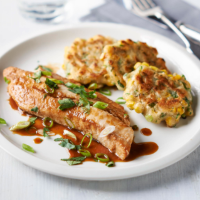 Serve the fish and fritters, spooning over any sauce; garnish with salad onions and coriander.